AcnEase Acne Maintenance Treatment - 1 Bottle helps to prevent chronic and severe acne from recurring, as well as keeping other skin conditions such as rosacea under control. Formulated from all-natural botanicals, it works from within to tackle the underlying cause of the problem, restoring the internal balance that can be disrupted by endocrine changes, the environment, stress, medication and diet. Safe and free from side effects, it will help to keep your skin looking clear and healthy. AcnEase® is a most effective Botanical Therapeutic® that treats existing acne and prevents new cysts and pimples from forming. In addition, with recommended use, the ingredients in AcnEase® will make your skin clearer and healthier with less blackheads, whiteheads and redness. 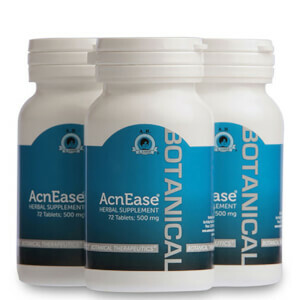 AcnEase is perfect for those who suffer from: Adolescent Acne, Hormonal Acne, Menopausal Acne (women), Chronic Acne, Acne aggravated by spicy and greasy food, smoking, stress, consumption of alcohol or other medicines, Facial and Body Acne, Cystic Acne. Acne will significantly improve or disappear after a full course of therapy is completed (approximately 1 month). Use of a maintenance dose has been demonstrated to limit the recurrence of acne. 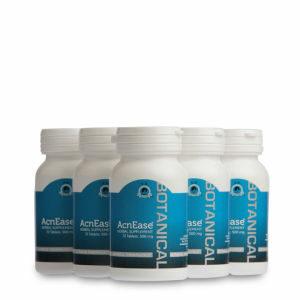 Use AcnEase® as directed and complete the recommended 1-month course of treatment. For those with chronic or severe skin problems, the treatment may need to be extended to 2 or 3 months to obtain the best results. After the necessary course of treatment is completed, some decide to go on a maintenance regimen of 2-3 tablets, 2 times/day. Please take these factors in to consideration when ordering. Take 2-3 tablets, 2 times a day. Gardenia Fruit: Reduces internal heat by cooling the blood and removing toxins. Houttuynia: Promotes the drainage of pus. Scierotium: Improves metabolism and assists digestion. Dandelion: Reduces swelling and sores, decreasing the sizes of abscesses and dispelling the local inflammatory response. Balsam Pear and Mustard Leaf: Alleviate heat and improve intestinal function, as well as decreasing phlegm and reducing pain. I can't believe these people who make this ****! The directions for use, as stated on the bottle: For best results [...] minimum 4 weeks... For mild acne the recommended dose is 8 tablets (4 tablets, 2 times/day); for moderate acne the recommended dose is 12 tablets (4 tablets, 3 times/dat); for moderate severe and/or chronic acne, or those weighing more than 180 lbs up to 18 tablets a day may be recommended (6 tablets, 3 times/day) THE BOTTLE CONTAINS 72 TABLETS. THAT MEANS! : Even if you take the minimum ammount of 8 tablets a day, you will need to buy at least 3 bottles. For those with moderate / severe acne, which let's face it, if you're buying pills, it's probably not mild... IT WOULD F****** TAKE 7 OF THESE BOTTLES TO FINISH THE MINIMUM COURSE. I am absolutely outraged! At the product, and at this site for obscuring the fact that it takes hundreds of pounds to do what the product claims. I don't care if it works, I could buy a gallon of benzoyl peroxide and bathe in it for this money! Have been taking AcnEase for more than 2 weeks. It's incredible! I take 2 tablets 2 times a day and I could already see results in the 1st week. Now that I'm about to finish my 1st bottle, I can say that my acne has significantly reduced to even none. Downside is it can be a little expensive.. Since that take Acneasy (3 weeks) I see some difference in my skin (fewer buttons andscar) but is away of the promised results. These are amazing plus they're natural! I have suffered from hormonal spots for months.. Then I found these! I have just completed my first pot & I'm so happy with the results. However one pot doesn't last longer than a week. No side affects what's so ever, I can't wait to see what my skin looks like after I've finished the whole course. Great product...the spots seem to disappear when using the tablets. After just one month of use my acnea has almost totally disappeared. I love this product even though it's so expensive. Im taking it for already almost one month and see results, will continue for now to ensure long term improvement. Acne Maintenance Treatment is amazing! These herbal tablets are the only thing that has ever given me clear skin. Buy these with confidence!